PHUKET: The body of a man last seen jumping off Thao Thepkrasattri Bridge at the north end of the island on Thursday (Mar 7) has been found more than 50 kilometres away south of Phuket. The body of Winai Jokthong, 37, was recovered this afternoon after two fishermen from Rawai reported finding a body in the water off Koh Kaew Yai, about 1.3km south of Promthep Cape, Phuket’s southernmost point, at 12:50pm today (Mar 9). 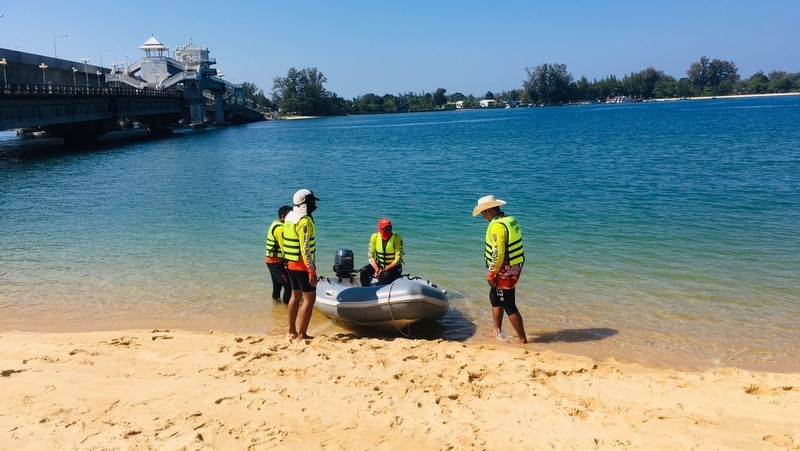 Rawai Deputy Mayor Teerapong Taodeng received the call from local fishermen Weerachot Pranpsing and Chalong Srisuwan, who had found the body face down in the water. Mr Teerapong dispatched a boat from Rawai Municipality division of the Department of Disaster Prevention and Mitigation (DDPM) to recover the body, which was brought back to Phuket and taken to Vachira Phuket Hospital in Phuket Town. Relatives have now confirmed that the body is of Mr Winai. The search for Mr Winai began on Thursday after he was recorded on CCTV showing him parking his motorbike on the Thao Thepkrasattri Bridge at the north end of the island and sitting on the wall on the edge of the bridge before jumping into the sea. Mr Winai’s father, Yan Jokthong from Rassada, told police that his son Winai suffered from mental health issues.